Notorious asphyxiator carbon monoxide has few true admirers, but it’s favored by University of California, Irvine scientists who use it to study other molecules. 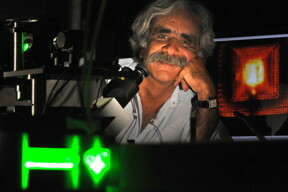 With the aid of a scanning tunneling microscope, researchers in UCI’s Center for Chemistry at the Space-Time Limit employed the diatomic compound as a sensor and transducer to probe and image samples, gaining an unprecedented amount of information about their structures, bonds and electrical fields. The findings were published in Science Advances. To achieve these results, CaSTL scientists attached a single carbon monoxide molecule to the end of a sharp silver needle inside the scope. They illuminated the tip with a laser and tracked the vibrational frequency of the attached CO bond through the so-called Raman effect, which leads to changes in the color of light scattered from the junction. The effect is feeble, only one part per billion or so, according to Kumar Wickramasinghe, a UCI professor of electrical engineering & computer science and veteran CaSTL faculty member who was not involved in this study. But the tip of the needle in the scanning tunneling microscope acts like a lightning rod, amplifying the signal by 12 orders of magnitude. By recording small changes in the vibrational frequency of the CO bond as it approached targeted molecules, the researchers were able to map out molecular shapes and characteristics due to variations in electric charges within a molecule. The probed molecules in the experiments were metalloporphyrins, compounds found in human blood and plant chlorophyll that are exploited extensively in display technologies. The captured images provided unprecedented detail about the target metalloporphyrin, including its charge, intramolecular polarization, local photoconductivity, atomically resolved hydrogen bonds and surface electron density waves – the forces that dictate the functionality and structural transformation of molecules. In other words, chemistry. According to lead author Joonhee Lee, CaSTL research chemist, one of the key results of the experiments was the elucidation of the electrostatic potential surface of the metalloporphyrin molecule – basically, its functional shape, which until recently had been a theoretical construct. He said the ability to determine this will be particularly beneficial in future studies of macromolecules, such as proteins. This work is very much in the realm of pure, fundamental science research, Lee notes, but he thinks there may be some practical applications for single-molecule electromechanical systems in the near future. The CaSTL project was supported by the National Science Foundation.